Born in Amritsar Punjab during the reign of the Mughal Empire, Bhai Taru Singh was raised as a Sikh by his widowed mother. During this time, Sikh revolutionaries were plotting the overthrow of the Mughal governor of Punjab, Zakaria Khan. Bhai Taru Singh and his sister gave food and other aid to the Gursikhs. An informant reported them to Zakaria Khan, the governor of Punjab, and the two were arrested for treason. Though his sister’s freedom was bribed for by the villagers, Bhai Taru Singh refused to seek a pardon. Bhai Taru Singh Jee had partaken amrit from Bhai Mani Singh Jee and was much influenced by him. When he was caught along with his sister. many Sikhs offered to rescue him as they were famous to attack in the midnight in those days. Bhai Taru Singh However said that he wanted to show Mughals that Sikhs are not afraid of death. However at much convincing he allowed his sister to be rescued. Sikhs and villagers paid bribes and got his sister rescued. After a period of imprisonment and torture, Bhai Taru Singh was brought before the Khan and asked him where he got his powers from to undergo all of the agony. His reply was through his Keshas given by Guru Gobind Singh. Zakaria Khan then gave him the choice of converting to Islam or having his hair cut off. In reply, Bhai sahab asked him if by converting to Islam could he guarantee that he would never ever die?. If the answer was no, then its better to die serving his Guru. 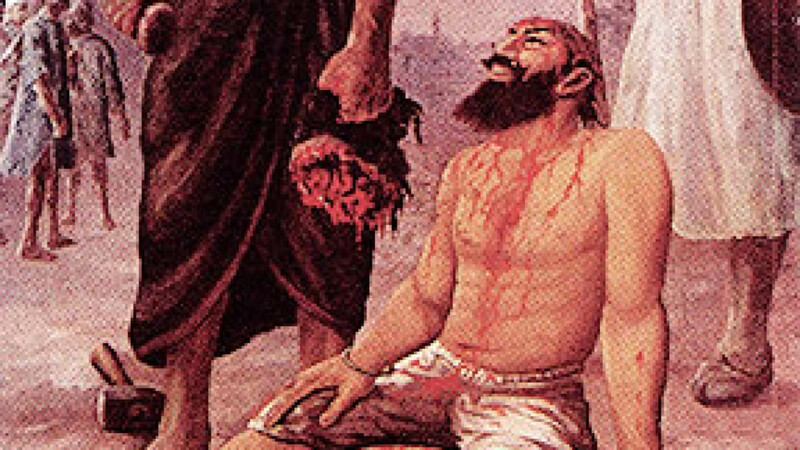 In response to having his hair cut off, Bhai Taru Singh said that Zakaria Khan would be killed by Bhai Taru Singh’s shoe. Angered, Khan called barbers to cut Bhai Taru Singh’s hair but they were scared to go near him, so Zakaria Khan called an executioner to cut off his scalp. Amidst the torture bhai sahab could only be heard reciting Japji Sahib. The exact method of his execution is somewhat ambiguous. Sikhs believe that once Bhai Sahib had been returned to prison to await a slow death . Holy water(Jal) from Amritsar was brought after 22 days and put on his head to begin his last rites. Zakaria Khan was stricken with unbearable pain and the inability to urinate. As a last resort, Zakaria Khan sent an apology to the Khalsa Panth for his persecution of the Sikhs and begged for their forgiveness. It was suggested that if Zakaria Khan hit himself with Bhai Taru Singh’s shoes, his condition might be lifted. Although the shoe cured the Khan’s condition, he died 22 days later from hitting himself with the shoes. Upon hearing that he had miraculously outlived the Khan, Bhai Taru Singh left his body. A more elaborate version of this narrative includes attempts by the Khan’s barber and cobbler to forcibly cut off Singh’s hair and, failing that, his scalp. God prevented them from touching him with their tools, and finally a carpenter was brought in to cut off his head with an adze. In other variations of the story, the top of the skull was removed with the hair and scalp. After some days a squad of Singhs passing that way, met Bhai Taru Singh. Bhai Taru Singh told them about the trouble of Rahim Bakhsh. That squad raided Patti and returned his daughter to him. The Commander of Patti was killed in that raid. Khushala, the headman of village Pahoola, informed Zakria Khan, the Governor, the secret behind this happening. The Governor sent soldiers to arrest Bhai Taru Singh. Bhai Taru Singh said to the soldiers who had come to arrest him, “You have come to take me away on the orders of your master. I, bound by the orders of my Master, cannot let you go without meals.” The soldiers acceded to his request and after taking meals, arrested him and presented him before the Governor. Hoping that Bhai Taru Singh will help in arresting other Singhs if he embraces Islam, the Governor said to him, “All your sins can be pardoned if you become a Muslim and cut and give me those long hair of yours so that I may make a string of them for weaving my bed.” Bhai Taru Singh said, “I shall keep my faith with these hair and you shall be controlled by my shoes and with these you will die.” The Governor was beside himself with rage on hearing this. 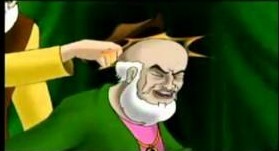 He got Bhai Taru Singh mounted on rotating wheels of torture and then from a cobbler got his scalp removed so that hair may not grow again. After that he got him thrown in a ditch. In the evening the Governor could not pass urine. When the efforts of the physicians failed, the Governor sent Bhai Subeg Singh to seek pardon from Bhai Taru Singh. He sent him to the leader of Dal Khalsa. The leader said, “The Governor can pass urine if he is hit on the head with the shoe of Bhai Taru Singh but he will die before Bhai Taru Singh. The words of the Singh must be fulfilled. When the Governor took the shoe of Bhai Taru Singh and hit his head with it, he was able to urinate. After surviving for 22 days with the help of that shoe, the Governor died on the 1st July, 1745 A.D. Bhai Taru Singh gave up this mortal body after hearing about the death of the Governor. Pictures and Videos - Sikhs Blocked off London Protested Outside Parliament Peacefully.